This contemporary matte black laptop desk and TV table tray is the perfect transportable work space for studying, reading, writing and surfing the web.This ebony tabletop has a multi-functional surface space. You could use it for playing board games or cards with the family. Have breakfast in bed on this over-the-leg dining table. Its surface is matte finished so you can use a mouse and also helps your laptop to not slide around. This desk is lightweight with adjustable legs to move the surface height from 11.5" to 16.5". So lounge in bed or rest on the couch with this sturdy and convenient workstation desk tray table. 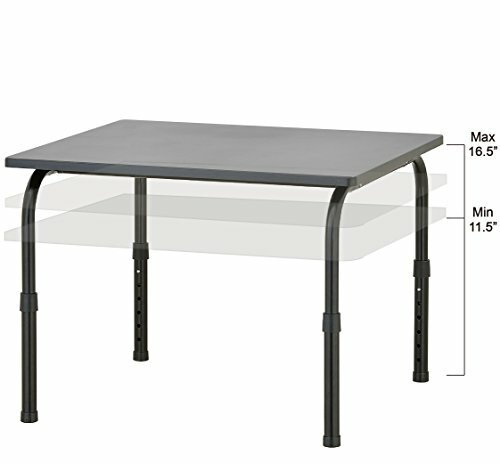 Approximate Dimensions (in inches): 11.5-16.5 H X 24.0 W X 22.0 D.
Black metal portable laptop desk tray and workstation. Perfect for laptops, dining, reading, writing, studying or playing games. Features adjustable height from 11.5 inches to 16.5 inches.